Can't say where this idea came from (or why fish seem are regular elements in my drawings!!) 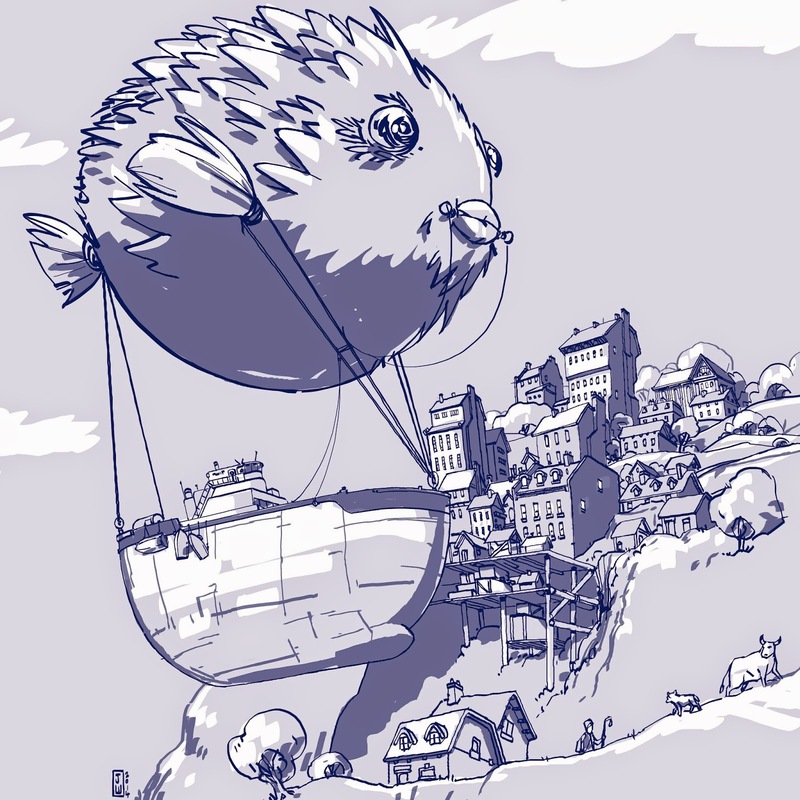 but anyway, the idea of a puffer fish as a blimp or balloon for an air ship struck me as amusing and interesting. As you can see in the the drawing labeled "2", I tried a slightly different landscape with the intention of making the boat more approachable to the viewer. I'd imagined some people very close in the foreground getting ready to depart with luggage and children etc. but the wide expanse of the deck didn't inspire me much. I do prefer the tug boat style of the boat in this version but when I got to inking, I went back to the original with the intention of adding more tug-boat-like elements in, which I did to a small degree. The town worked out really well. I enjoy drawing towns and cities and places and imagine exploring them as I draw. The other thing I'm rather pleased about is the inking. I'm still not comfortable inking, and am fighting with my technology a bit, so after spending WAAAAY too long trying to get a brush I liked, I just grabbed the simplest one and started in. I knew the line work wasn't going to be beautiful (far from it), but I just wanted to get it out. The resulting drawing would be quite at home in my sketchbook. As I said, the line isn't at all perfect, but I've got to get away from that impossible ideal. Ah, and one last thing. About the title; It doesn't really mean much but suggests a real place, which helps to make the image iiself feel more real. I was thinking of calling it "Morton Bay, September 10th", to suggest the world was odd and/or lighthearted before Sept 11th, 2001, but I don't like making statements with my work, so, "Morton Bay" it is! Here's the final version all on its own. Fantastic, fantastic, FANTASTIC! Extremely well done art as usual (love the kinetic spines on the puffer, the conning tower on the boat and the intricate town) -- but it's the idea that's so great! A puffer fish dirigible! SO COOL! Thanks! I'm amused that you (and others) find the idea so surprising and imaginative, but I guess that's what keeps me going most of all - trying to think up weird and interesting things and then trying to draw them to make them look real or possible.